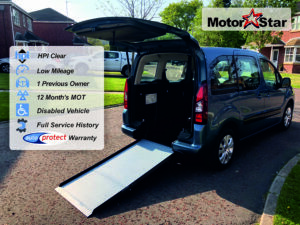 Choose a Motorstar for your used wheelchair accessible vehicles, we hand pick the best disabled cars and vans direct from mobility which come with vehicle history low previous owners. Our vehicles are professionally converted by companies such as Constables, Gowrings, Allied, Versa, Gleneagles and more mobility conversion companies. Our used types of WAV’s are available from large minibuses to multipurpose vehicles all sizes with easy access ramps and Qstraints. Wheelchair Accessible Vehicles give you the ease and freedom to get on with day to day activities such as trips to the shops, meeting friends or day trips out, designed with minimum fuss will improve your independence.